CHICAGO – “Hesher” ends with a middle finger and I shot one right back to the screen. Rarely has a film so completely misunderstood the grieving process and played faux tough in an attempt to be edgy instead of heartfelt. Like a knock-off of Chuck Palahniuk produced by people raised only on Sundance films, “Hesher” is a mess. It hurts me to say so. Stars Joseph Gordon-Levitt and Natalie Portman deserve mention in any conversation of the best actors of their generation and I generally love what they do. There was no bigger champion of “Black Swan” than this critic and JGL has been underrated for years, giving great performances in “Brick,” “The Lookout,” “(500) Days of Summer,” and more. Co-stars Rainn Wilson and Piper Laurie are also commonly effective. 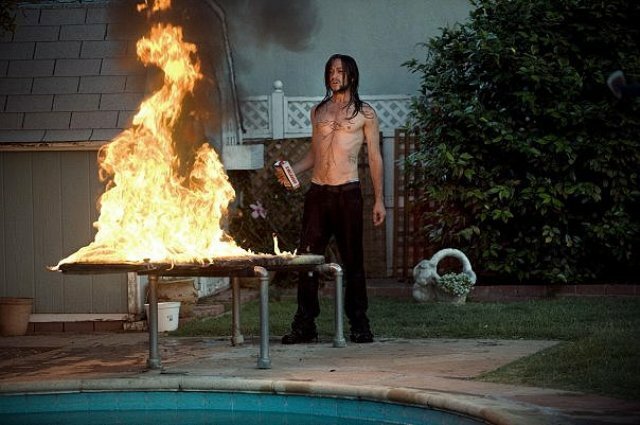 Read Brian Tallerico’s full review of “Hesher” in our reviews section. There’s nothing effective about “Hesher” unless the effect you’re looking for is anger. Filmmaker Spencer Susser (who also co-wrote) makes a film that argues that the stasis of depression can only be burst with aggression. If you’re being bullied, fight back. If you’re overcome by grief, commit an act of violence. If your mom died, get over it. If life gives you lemons, make piss-filled lemonade. T.J.(Devin Brochu) has been handed a raw deal by life. His mom died in a horrible car accident (the opening scene features T.J. trying to stop the mangled car from being impounded). His dad (Rainn Wilson) sits around all day in his underwear, alternating pill-popping with sleeping. Both take T.J.’s sweet grandmother (Piper Laurie) for granted. And T.J. regularly gets the crap beat out of him at school. Then Hesher (Gordon-Levitt) appears. Continue reading for Brian Tallerico’s full “Hesher” review. ”Hesher” stars Joseph Gordon-Levitt, Natalie Portman, Devin Brochu, Rainn Wilson, and Piper Laurie. It was written by Spencer Susser & David Michod and directed by Susser. It is rated R and was released on May 13th, 2011.